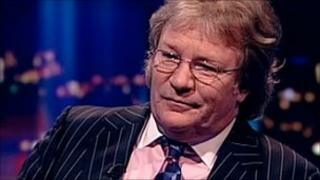 Comedian Jim Davidson is one of two men arrested and bailed by the Met Police on suspicion of sexual offences. Officers from Operation Yewtree, set up in the wake of the Jimmy Savile scandal, arrested Mr Davidson in west London earlier on Wednesday. Mr Davidson's solicitor said his client - who has been bailed to return in March pending further inquiries - "vigorously denies" the alleged crimes. A 53-year-old man was also arrested in Hampshire and subsequently bailed. Scotland Yard said the arrests were not connected to the allegations made against ex-BBC presenter Savile, who died in 2011 aged 84. In a statement, Mr Davidson's solicitor, Henri Brandman, said two women have made allegations dating back approximately 25 years. "The complainants were then in their mid-20s. Jim vigorously denies the allegations. "He answered police questions as fully as he was able after this passage of time. "He has not been charged with any offence. Neither he nor I will be making any further comment." Mr Davidson, 59, presented long-running BBC One shows Generation Game and Big Break. His break came in 1976 when he won TV talent show New Faces, he hosted his own TV show The Jim Davidson Show, and has had continued success as stand-up comic. Mr Davidson has been widely reported to have been a planned housemate in the Channel 5 show Celebrity Big Brother which begins on Thursday night. The TV channel has made no comment on the matter. He was appointed an OBE in 2001 for his services to charity. A BBC News cameraman has filmed footage of people, believed to be detectives, leaving Mr Davidson's house in Stockbridge, Hampshire, with boxes and bags. Operation Yewtree is the Met's investigation into allegations, some dating back decades, that have arisen since Savile was accused of abuse. The third strand, under which the two men were arrested on Wednesday, relates to alleged complaints against other people unconnected to the Jimmy Savile investigations. These men are the ninth and 10th to be questioned as part of the police operation. Of these, nine have been under arrest. High-profile names arrested in connection with the investigation are PR consultant Max Clifford, comedian Freddie Starr, DJ Dave Lee Travis and former TV producer Wilfred De'Ath, and former Radio 1 producer Ted Beston, who all deny any wrongdoing. Gary Glitter, who was also arrested, has not yet made a statement. A man in his 80s was also questioned. Savile was a BBC Radio 1 DJ and the presenter of the Jim'll Fix It show on BBC One. The police say 450 victims have alleged abuse by Savile alone.